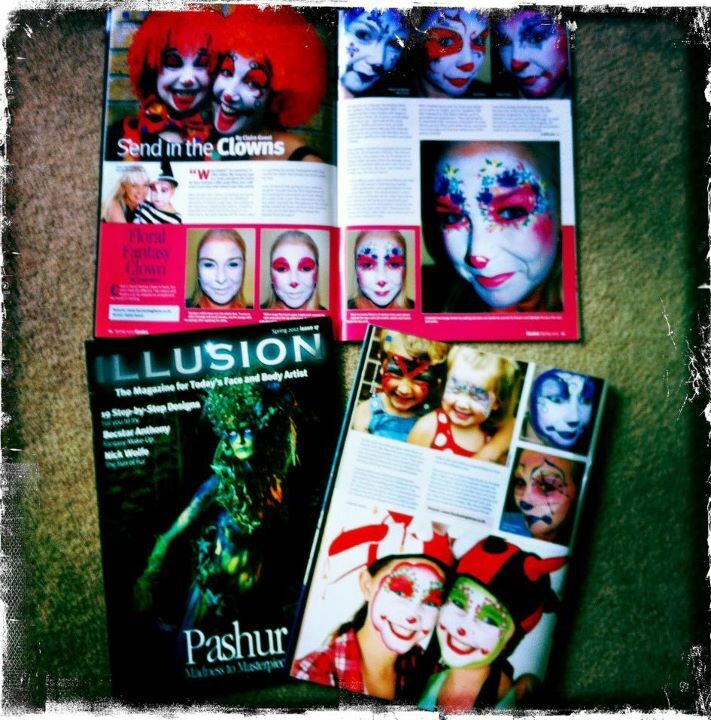 Just over 4 years ago when I first set up Fascinating Faces, I was introduced to a fabulous and very glossy magazine called “Illusion”. It was crammed full of vibrant photos of some incredible artwork by amazingly talented face and body painters from all over the world. I couldn’t help but subscribe to the magazine and am now the proud owner of every edition except the illusive first issue! Julie Oliver and Claire Pick work tirelessly to produce each issue; scouring the globe for inspirational photos to publish; conventions and festivals to report on and endless step-by-step tutorials by some of the best artists in the world. I have always believed in aiming for the stars with everything I face in life and my painting is no exception. I have had many a day dream that one day, just one day, I may create something worthy of Julie and Claire’s attention and have a photo published in Illusion. Long term dreams and goals are great for motivation and inspiration. But perhaps not such long term after all …. towards the latter end of 2011 Julie contacted me to ask me if I would consider providing a step-by-step tutorial for their Spring magazine. My heart was in my throat and I had more butterflies careering around my stomach than I could ever paint in a lifetime!!! The step-by-step led to me writing a story of how I have become somewhat known for my fascination (excuse the pun) with clowns. Two manic painting sprees and photo shoots followed – one photographed by me and the second professionally shot by my wonderful photographer friend, Francoise Stevens plus beautifully modelled by my daughter and Fran’s identical twin daughters! Shortly after I submitted the editorial together with numerous photos and waited with bated breath …. until this week!!! There was a huge thud on my doormat yesterday as an envelope filled with three gloriously glossy copies of Issue 17 of Illusion Magazine landed! I raced to rip open the envelope and promptly sobbed my eyes out with pride as I cast my eyes over the 3 page (YES THREE PAGE!!) article in front of me. I was completely blown away to see the other amazing artists featured in the magazine and am totally humbled to be sharing pages with them. So, from the bottom of my heart, thank you Julie and Claire for really making a dream come true. Watch this space – I’ll be loading up some wonderful shots of the photo sessions that led to the article pics soon.